Recently my friend, who is a college professor, invited me to speak to her students. They were about to graduate with shiny new degrees in creative writing, and she thought I might have some advice on thriving in the real world. You know - how to find a job, pay off your student loans, and avoid moving back home, all while making steady progress on your creative endeavors. As the kids would say: LOL. Despite the fact that I'm not exactly the model of success, I agreed to visit the class. My own memories of graduating from college in 2004 were still fresh - specifically, the belief that my life would unfold according to a very specific timeline. "I'll probably struggle for a few years," I generously told myself. "But by the time I reach the ancient age of 30, I'll be living on my own farm, publishing bestselling novels, and spending summers vacationing in the French countryside." Needless to say, things did not quite work out that way. And as much as I hated to break it to those college seniors, the road to success is rarely a straight line. This is especially true for creative writing majors, who can look forward to a lifetime of rejection, compromise, existential crises, and financial risk. As I described the winding path I've taken, which includes crushing student loan debt, multiple career changes, and an ill-advised degree in library science, the students' eyes widened. My friend second-guessed her invitation. I apologized, again and again, for the doom and gloom I'd brought to their classroom. Eventually, I managed to pivot toward the positive. We talked about making time to write, the pros and cons of an MFA, and - most importantly - how there is no official timeline for life. 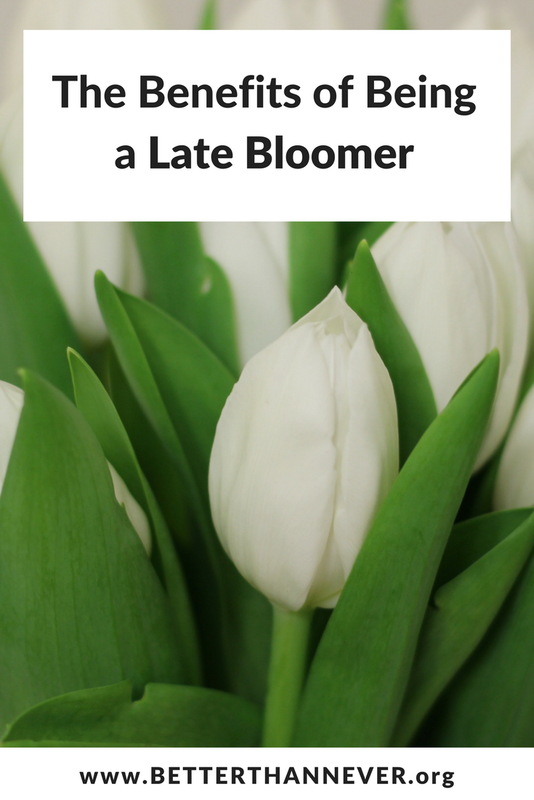 I'm pretty open about being a late bloomer (it's part of the title of this blog!) because accepting and embracing this identity has brought me peace and given me freedom. I wanted the students to know what took me years to learn - there are many benefits to being a late bloomer, and that writers in particular would be wise to appreciate them. You don't fall easily into the comparison trap. I'm 34, so pretty much everyone I knew in high school has checked off the traditional boxes - marriage, home ownership, children. Meanwhile I'm over here in my rental house, driving the car I bought from my in-laws 12 years ago, raising chickens instead of children, and budgeting like crazy so my husband can go back to school yet again. My life and goals are so different from most 34 year olds that the comparison trap simply doesn't apply. While I want some of the things other people have (real estate fever is real) I know those experiences will come when I'm ready. I just have to be patient. Now, the comparison trap is trickier when it comes to creative success. I won't lie - sometimes, I read the news that an acquaintance landed a book deal or a dream publication, and waves of white hot jealousy roll over me. Or I wake up to my third rejection of the week, and I wonder why I even bother trying. Or some magazine publishes yet another list of 30 improbably-successful writers under the age of 30, and I feel like my expiration date has passed. In those moments of weakness, I remind myself that being a writer and being published are two different things. You have control over whether you write; you do not have control over whether you're published. I let the jealousy run its course, and then I get back to work. You have the freedom to try new things. According to this highly scientific CNN article, the average millennial jumps jobs four times in their first decade out of college. I'm barely a millennial, but this stat still rings true. My first job out of college was retail - I worked in a bookstore. Then I got a job at the university library, where I held a few different positions thanks to promotions. Then I quit the library and worked in the research and development office. Then I went back to school for my MFA and taught undergrad classes. After I graduated, I tried my hand at freelancing before finally landing a job at a marketing agency - despite having no real marketing experience or a business degree. While my resume might look like a mess, it's actually full of hidden strengths. Because it took me a while to find my place, I was able to have a lot of different experiences and develop a variety of skills. I also had the freedom to quit jobs that weren't a good fit and go back to school at the age of 29 - things that would have been far more difficult if I had a mortgage to pay or children to feed. 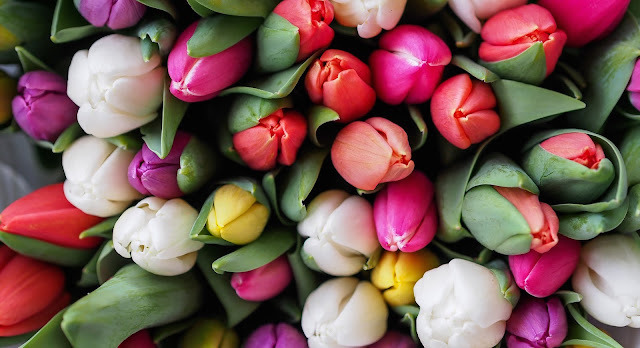 In this case, being a late bloomer definitely paid off. You avoid making (too many) mistakes. I got married at 30, which doesn't seem all that old - until you think about the fact that I met my husband when I was 20. We waited ten years to get married, and in that time many of our friends met someone, dated them, and got hitched. In some cases, we'd been dating longer than some of my friends had known their spouses! While we always had a very strong feeling that this was it, we weren't in a rush to prove it. Frankly it was nice to grow and nurture our relationship without the added pressure of marriage. Many people rush into things because they're concerned with a self-inflicted timeline. They feel like they must do certain things by a certain age, and if they fall short of those goals then they've failed. This is a terrible way to live your life, and a great way to make some really bad choices. Marriage - ideally - is forever. A 30 year mortgage is a large chunk of your life. 40 hours a week in an office is a big commitment. Patience is a privilege. If you have it, use it. You have a deeper appreciation for milestones. When I spoke to the students in my friend's class, many of them were interested in graduate school. Like a true late bloomer, I told them not to rush. I finished my undergraduate degree when I was 22 years old. I didn't go back to school for my MFA until I was 29. That seven year gap was incredibly instructive and important. During it, I worked and earned money. I moved to a new state, strengthened my relationship, made a great group of friends, read hundreds of books, adopted two dogs, and kept writing. By the time I decided to apply for an MFA, I knew exactly what I was giving up, and what I'd be gaining. I treasured those three years in my program, because I knew what was on the other side. Plus I was a much better writer at 28 than I was at 22, which meant I got way more out of my workshops. The longer you wait for something, the more you appreciate it. The harder you work for a goal, the sweeter the victory. The further off the beaten path you wander, the better your stories will be. This is true for writers, but it applies to anyone trying to live a productive and successful life. So ditch the timeline. Lower your expectations. Keep working toward your goals, no matter how impossible they seem. Remember that you're a late bloomer. You've got all the time in the world. PS: All the jobs I've ever had + the danger of doing what you love.